With over twenty five years in the business, and an impressive roster of celebrity endorsers, Musashi is one of the most successful and best known Australia supplement manufacturers. Musashi boasts an extensive product range which caters to all types of athletes, and it is furthering this appeal with the release of two new products. One of these is the eagerly anticipated weight loss protein, Shred and Burn. 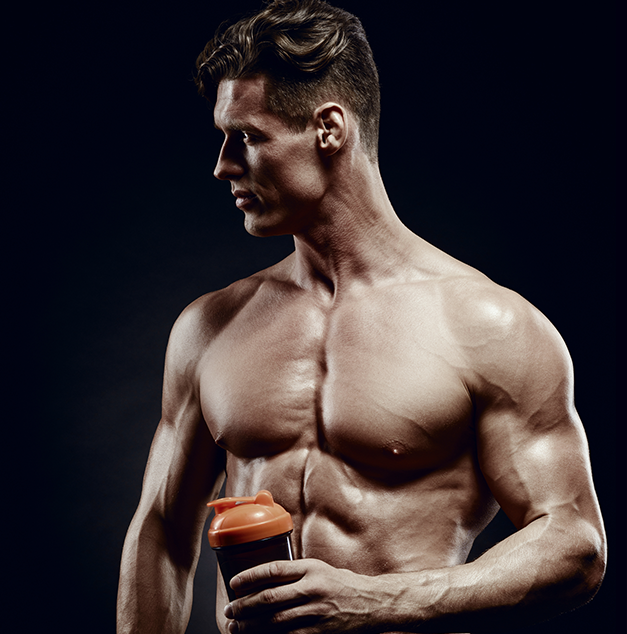 Musashi has a great reputation when it comes to proteins, and Shred and Burn looks like it's going to stack up well against competitor fat loss proteins like Max's Supershred and Elemental Nutrition Shredding Matrix. Interestingly, Musashi have chosen to list the product with the TGA and assign it an AUST L number. This is a common trend for Musashi, which reflects their intention to make substantiated therapeutic claims on key ingredients in the product. Musashi will most likely leverage most of their claims off the theobroma cacao HCA in the product. Because the product is listed with the TGA, it means that it doesn't come with the usual nutritional panel and list of ingredients that you find on most protein supplements. As such, it is hard to determine exactly what all the other ingredients (apart from the actives above) are in the product. For instance, all the label says in regards to the protein content is that it contains 20g of 'quality whey protein'. But we don't know what type of whey protein this is, however, with 3.7g of lactose in every serve, it would seem highly likely that it is in fact whey protein concentrate, as a whey protein isolate would not carry that much lactose/sugar per serve. Another fact that is not revealed is the amount of fat in each serve. While it is safe to say that it is unlikely to be over 3g, users always like to know exactly how much they are getting. While Shred and Burn doesn't feature a mega-list of fat burners, the 4 fat burner actives that are in the product are relatively well dosed, especially the Garcinia cambogia extract and theobroma. What's more, its great to see that the Garcinia extract is standardised to 55% HCA; equating to 825mg of HCA in every serve. This is more than most competitor products. In a general sense it is worth mentioning that Musashi is one of the few Australian sport supplement companies whose product are certified by Informed-Choice; a quality assurance program for sports nutrition products, that certifies that all nutritional supplements and/or ingredients that bear the Informed-Choice logo have been tested for banned substances by the world class sports anti-doping lab, LGC. As such, Musashi products are ideal for any athlete who is subject to drug testing as part of their competition regime. As touched on above, it's a pity that Shred and Burn doesn't come with the full fledged nutritional panel that everyone is used to when it comes to their nutrition supplements. Most people like to know exactly what's in their supplement, whether it's monitoring sodium or fat intake. The other major plus for Shred and Burn is its flavour. 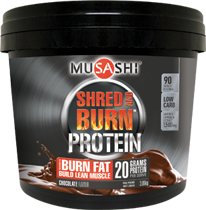 Musashi have made an artform of formulating great tasting products and Shred and Burn is no exception. Shred and Burn is available in Chocolate and Mocha, in a 3.06kg tub holding 90 serves. All considered, Musashi Shred and Burn is an exciting new product for Musashi that has been a long time coming. Already being a competitive market segment, Musashi have had to think carefully about how they formulate and position the product relative to other supplements in the same category. They have done this to an extent with their limited range of fat burner ingredients, some of which are dosed very well. But there are some who will obviously want to see more ingredients, even if they are dosed well. With the quality reputation of Musashi, its a given that Shred and Burn is a quality fat loss protein that should be received well by the Australian market.